Cooperation, when applied to baseball, is a pretty broad term. It may mean a cooperation in mind of thought, followed by concerted action, or it may be the method by which a' rhythmical system of play is effected. At any rate, it is one important essential to be taken -into consideration when perfecting teamwork. While discussing this subject recently with Manager Mack, he said in this particular respect: "The present-day ballplayers have the advantage over those of two or three decades ago. Today players on a team usually confide in each other; in fact, it's necessary that an understanding exist. That's what inside baseball fundamentally is - a harmonious working of the minds, and then execution by smooth physical cooperation. For instance, if today a player upon a team discovers that the opposing pitcher has difficulty in controlling his spit ball and that invariably it will be a ball, and with the advantage of this knowledge he has walked a couple of times, do you imagine he keeps mum, lays low, and don't say anything at all? Not much. The first thing that he pipes out when he comes to the bench is 'Wait out his spitter and you'll get him sure.' Others take the hint, and perhaps just by this discovery and later impartation of knowledge the tide is turned to victory before it is too late." Not So in Olden Days. But was it like that in the olden days? Connie contends not entirely so, and cites the following illustration to back up his claim. When he was taking his turn regularly behind the bat the principal difficulty he experienced was making a threw to third base, to catch a man stealing. Particularly did he find trouble in throwing if the batter was a right-hander and somewhat obstructed his line of vision. He said he had fair success in thwarting the ambitious theft artists in quest of the middle bag, but, try as he would, he couldn't make a decent play one time out of ten to third, although a shorter distance than to second. He managed to conceal his weakness from all but Johnny Ward and Mike Kelly, but when they got on second they never would stop running. Of course he said he thought it was all off when they "got next," and was surprised to find that they did not acquaint any of their teammates with what would have proved valuable information for them. From that it would be wrong to suppose that in those days there was a secret desire for individual par excellence to the sacrifice of team success, whereas on the other hand today individuality is not permitted, knowingly, to interfere with the greater essential, cooperation of individuals. What do you think? Where McBride Lost a Suit. I recall a very vivid instance which is directly opposite to the idea of one player not doing or telling something which would work to the advantage of a teammate. 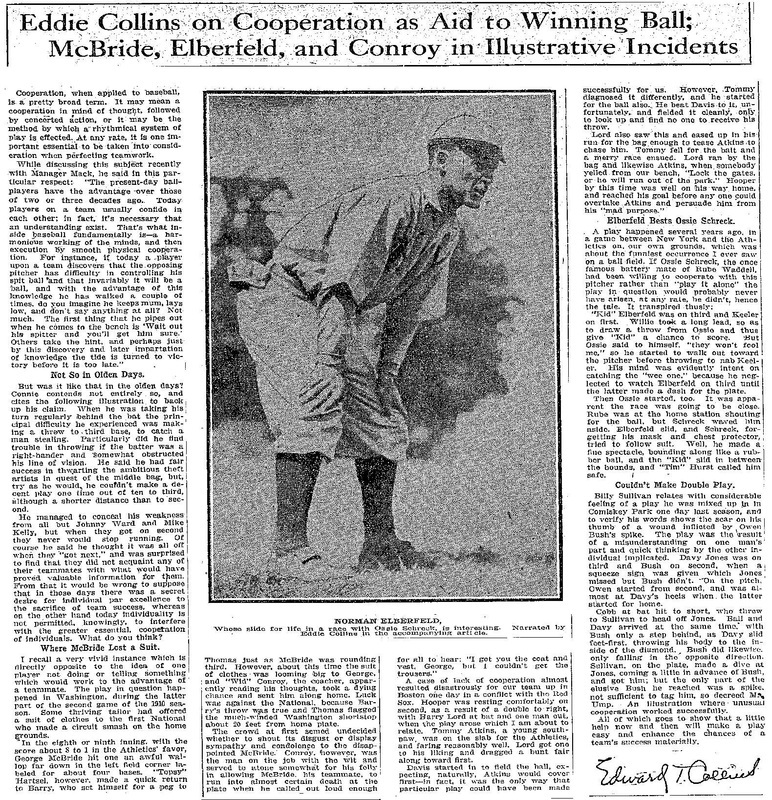 The play in question happened in Washington, during the latter part of the second game of the 1910 season. Some thriving tailor had offered a suit of clothes to the first National who made a circuit smash on the home grounds. In the eighth or ninth inning, with the score about 8 to 1 in the Athletics' favor, George McBride hit one an awful wallop far down in the left field corner labeled for about four bases. "Topsy" Hartsel, however, made a quick return to Barry, who set himself for a peg to Thomas just as McBride was rounding third. However, about this time the suit of clothes - was looming big to George, and "Wid" Conroy, the coacher, apparently reading his thoughts, took a dying chance and sent him along home. Luck was against the National, because Barry's throw was true and Thomas flagged the much-winded Washington shortstop about 20 feet from home plate. The crowd at first seemed undecided whether to shout its disgust or display sympathy and condolence to the disappointed McBride. Conroy. (however, was the man on the job with the wit and served to atone somewhat for his folly in allowing McBride, his teammate, to run into almost certain death at the plate when he called out loud enough for all to hear: "I got you the coat and vest, George, but I couldn't get the trousers." A case of lack of cooperation almost resulted disastrously for our team up in Boston one day in a conflict with the Red Sox. Hooper was resting comfortably on second, as a result of a double to right, with Harry Lord at bat and one man out, when the play arose which I am about to relate. Tommy Atkins, a young southpaw, was on the slab for the Athletics, and faring reasonably well. Lord got one to his liking and dragged a bunt fair along toward first. Davis started in to field the ball, expecting, naturally, Atkins would cover first�in fact, it was the only way that particular play could have been made successfully for us. However, Tommy diagnosed it differently, and he started for the ball also. He beat Davis to it, unfortunately, and fielded it cleanly, only to look up and find no one to receive his throw. Lord also saw this and eased up in his run for the bag enough to tease Atkins do chase him. Tommy fell for the bait and a merry race ensued. Lord ran by the bag and likewise Atkins, when somebody yelled from our bench, "Lock the gates, or he will run out of the park." Hooper by this time was well on his way home, and reached his goal before any one could overtake Atkins and persuade him from his "mad purpose." A play happened several years ago, in a game between New York and the Athletics on our own grounds, which was about the funniest occurrence I ever saw on a ball field. If Ossie Schreck, the once famous battery mate of Rube Waddell, had been willing to cooperate with this pitcher rather than "play it alone" the play in question would probably never have arisen, at any rate, he didn't, hence the tale. It transpired thusly:"Kid" Elberfeld was on third and Keeler on first. Willie took a long lead, so as to draw a throw from Ossie and thus give "Kid" a chance to score. But Ossie said to himself, "they won't fool me," so he started to walk out toward the pitcher before throwing to nab Keeler. His mind was evidently intent on catching the "wee one," because he neglected to watch Elberfeld on third until the latter made a dash for the plate. Then Ossie started, too. It was apparent the race was going to be close. Rube was at the home station shouting for the ball, but Schreck waved him aside. Elberfeld slid, aud Schreck, forgetting his mask and chest protector, tried to follow suit. Well, he made a fine spectacle, bounding along like a rubber ball, and the "Kid" slid in between the bounds, and "Tim" Hurst called him safe. Billy Sullivan relates with considerable feeling of a play he was mixed up in Comiskey Park one day last season, and to verify his words shows the scar on his thumb of a wound inflicted by Owen Bush's spike. The play was the result of a misunderstanding on one man's part and quick thinking by the other individual implicated. Davy Jones was on third and Bush on second, when a squeeze sign was given which Jones missed but Bush didn't. On the pitch, Owen started from second, and was almost at Davy's heels when. the latter started for home. Cobb at bat hit to short, who threw to Sullivan to head off Jones. Ball and Davy arrived at the same time; with Bush only a step behind, as Davy slid feet-first, throwing his hody to the inside of the diamond. Bush did likewise. only falling in the opposite direction. Sullivan on the plate, made a dive at Jones, coming a little in advance of Bush, and got him; but the only part of the elusive Bush he reached was a spike, not sufficient to tag him, so decreed Mr. Ump. An illustration where unusual cooperation worked successfully. All of which goes to show that a little help now and then will make a play easy and enhance the Chances of a team's success materially.